I’ve recently completed my kitchen renovation and wanted to share the before and after images to help anyone else thinking of doing the same thing. 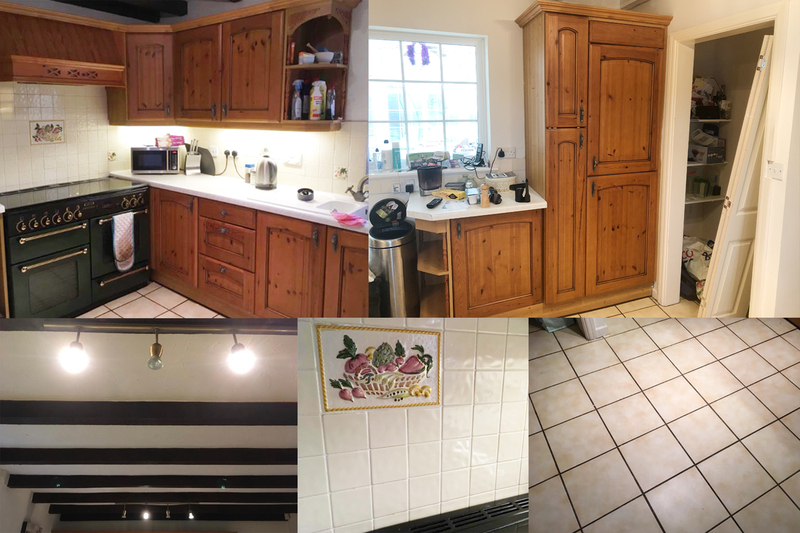 After living in our house with a dated kitchen for 10 years, we decided to try and give it a bit of a makeover. We planned to do most of the work ourselves, so we were a little worried that it would end up looking a bit rubbish. But, it didn’t! It looks pretty fab. 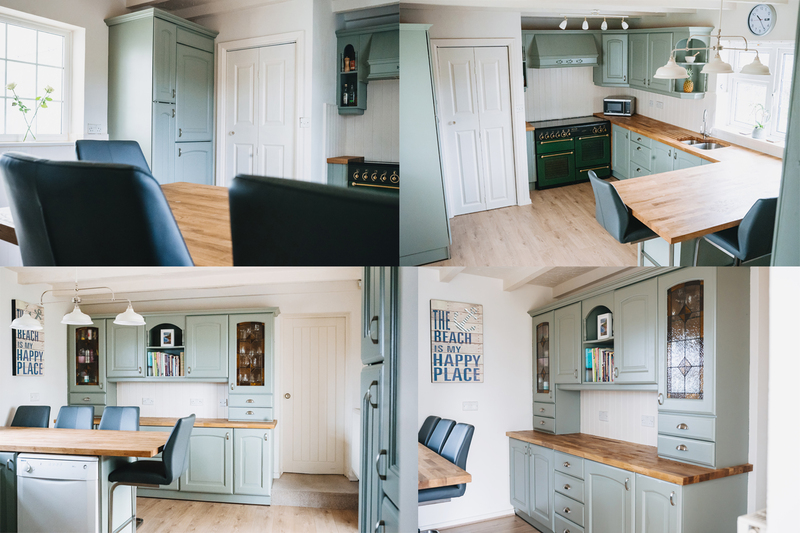 I know loads of people have similar kitchens, so before you chuck them out, think about changing a few key elements and save yourself a fortune. There’s links at the end of the post to all the suppliers used. Replaced the worktops, sink & taps. Added a door for our new ‘pantry’. Glued tongue and groove over the old tiles. Painted the cupboards/drawers and added new handles/knobs. Painted the walls and ceiling. Bought barstools for the new breakfast bar. List of suppliers at the end of the post. It took a while for us to work out what sort of design we wanted for the kitchen. I enlisted A LOT of help from friends (they are all rolling their eyes and nodding if they are reading this) for the look and feel of the kitchen. We opted for a “country kitchen” feel because it went well with the house and the existing design that we had. We were on a very tight budget, so spent a lot of time researching prices and looking for online suppliers that would be cheaper than the high street DIY stores. We knew we were going to keep the walls Almond White (Dulux) as we have the colour throughout the house. For the cupboards we opted for the more expensive Farrow & Ball paints. We tried a few tester pots on the doors and eventually chose Pigeon. It’s a sort of greeny grey colour and it looks different in different lights. We also bought the Farrow & Ball undercoat as advised but used a primer from Wickes too. Of course, there’s the option of matching a Farrow & Ball colour with a cheaper paint but we’ve done that elsewhere in the house and it just isn’t the same finish. There wasn’t a massive difference in price to choose the paint that we wanted, so we went for it. I’m not going to lie, painting the cupboards and all the wood work was a monumental task. It took WEEKS and was very slow going. However, if we’d paid someone to do it for us, or bought new cupboard doors, it would have cost so much more. In hindsight, it was worth it, but there was a LOT of whinging (from me) and frustration (from me) about how long it was taking. One of the biggest issues with painting the doors was that we just didn’t have room for them all to dry. I used boxes and cardboard on the floor and anything else I could get my hands on to lay them out but eventually ran out of room. I painted until I ran out of drying space and then went back the next day to carry on. TIP – THINK ABOUT WHERE YOU CAN LET THINGS DRY AND MAKE PLENTY OF ROOM. Being total novice kitchen renovators we didn’t think to mark the doors in any way so they could be put back in an orderly fashion. Oh no, we just stacked things willy-nilly around the place and so I had a fun afternoon of trying to work out which door went where (let’s just say I wasn’t successful the first few times). Picture on the left below is how NOT to hand doors. TIP – MAKE A NOTE OF WHERE EACH DOOR BELONGS. Obviously, the same attitude was taken with all the screws and fixings. We chucked everything in a plastic bag and by some miracle, we only ended up with a few things missing at the end. TIP – MAKE A NOTE OF WHICH SCREWS AND FIXINGS GO WITH WHICH BITS. Painting the walls was pretty straightforward and I painted them twice over 2 days. We had very dark beams on the ceiling and so it took a few coats to cover those and paint the ceiling. TIP – BE CAREFUL. CHEAP MASKING TAPE IS NOT YOUR FRIEND. IT WILL BETRAY YOU. After shopping around, we thought that we wouldn’t be able to afford a new floor. We spoke to a few outlets on industrial estates and they all assured us that we’d need a screed to level the dodgy tiled floor. Add that to the cost of the floor and then whole thing was too much. Luckily, our lovely carpenter suggested a friend of his that owned his own flooring business. Steve is friendly and efficient and sorted a new floor with minimum fuss and totally within budget. His contact details are at the end of the post. TIP – USE STEVE. We wanted to move the lights slightly to have them hang directly over the breakfast bar. 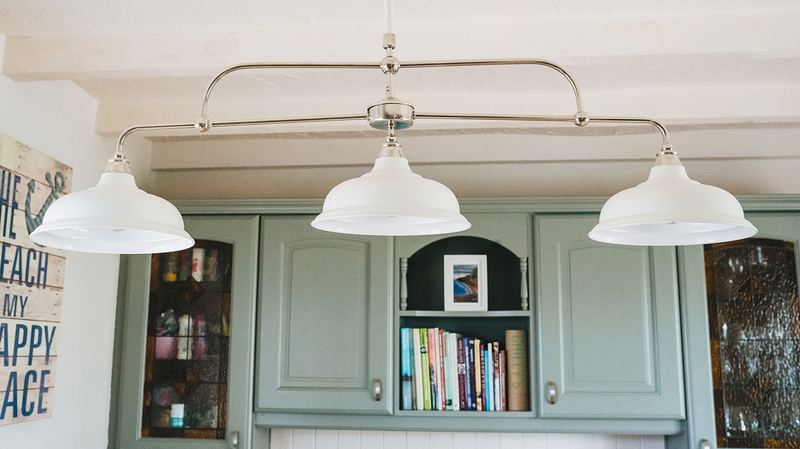 We chose some pendant lights from Next and then some plain bar lights from John Lewis. Both fittings cost less than £200 and our very lovely and clever friend Dave came to fit them for us. Don’t worry, he got a nice bottle of rum and some vouchers for his troubles. TIP – KNOW A DAVE. Resigned to our budget, we only expected to be able to afford a laminate worktop but after some research we realised that we could order some solid oak from Worktop Express and it wasn’t going to cost too much more. We chose a sink and taps from there as well. The worktops were fitted by local carpenter Gareth Jones, who’s done a beautiful job. The tongue and groove was a late decision. As you can see from the pictures we had a wall full of yellow tiles with ahem, interesting fruit designs dotted around the place. We assumed that it would be too expensive to have the tiles removed and replaced so we’d made peace with keeping them – even though we really didn’t want to. Luckily, the carpenter came up with a brilliant solution – to glue tongue and groove over the top of them! He made new windowsills too and it really finishes the kitchen off. Without it, I think the kitchen would look unfinished. I really wanted an undermounted sink. I hated the sink we had. It was really hard to clean around the back of the taps and I liked the idea of sweeping mess straight into the sink. We had a quick look around at undermounted sinks and could have spent much more on one but we were just after something pretty plain and simple. In the end we opted for a plain stainless steel one from Worktop Express. The taps also came from there as well. As you can see from the picture we had two different dodgy taps on the old sink. It’s such a pleasure to use the new taps! The draining grooves were added by the carpenter, Gareth, after the sink had been fitted. Being solid oak, the worktop needed a few coats of oil before we could use it. We’re a bit paranoid about damaging the wood, so we’ve added extra oil around the parts that get wet regularly. It’s something that we’ll have to do every now and again. I’m not a big fan of shopping at all. I don’t really enjoy the process of choosing things and agonising over decisions. I’d much rather be reading a book or listening to music than trawling through websites. However, there was one bit of the whole experience that I thoroughly enjoyed and it only took about 15 minutes! We visited Bath a few weeks ago and I love mooching around the shop Anthropolgie. There’s so many pretty things in there – that I can’t afford. I mostly just go around touching things and imagining being able to buy things. This time, I decided to treat myself! I bought two coasters (£8 each) and a knob (£6)! I absolutely love the coasters. They are my favourite purchase in a long time and go so well with the colours in the kitchen. Next time I’m in Bath, I’m going to buy another two! Paint for the walls and other woodwork – Almond white from Dulux. Looks fantastic Gem! Well done! Well done guys, you have done an amazing job! 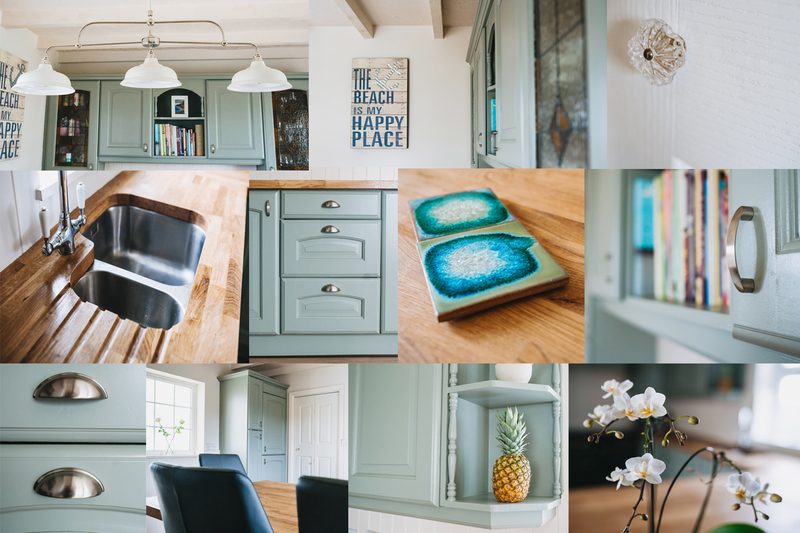 i love this blog and i love the new look to the kitchen! it’s the second time today that i’ve seen someone post that they’ve used pigeon paint (lol) so i’m going to keep it in mind for when we move. good old f&b!